Delft: Reinier Boitet, Stads Drukker, 1743. Hardcover. Good. Copperplate engraved text illustrations (178) by J.C. Philips and F. Ottens + woodcut tailpieces and initials. Volume II only of Two, Large-paper Folio (40.2 x 25.2cm or 16 x 10 inches) contemporary marbled calf on 7 raised bands with two lettering pieces and spine overall gilt (hinges split but held by most cords with some old sewing to repair, tips very worn) All edges Rouged. Titlepage in red and black + 678pp. This is the second volume dealing with letters H-Z. About a dozen leaves with minor foxing/staining else crisp tight clean pages. *A book of mythology, biblical iconography, all illustrated with EMBLEMS. The author cites Cezar Ripa, Zaratino Kastellini, Pier Valerianus and Horus Apollo as his sources. The illustrations are each in a roundelle within variously shaped baroque borders. This a very wide margined LP copy and has has many more illustrations than either of the other two volumes. London: Henry Vernon, 1857. Hardcover. Good. Hand colour tinted lithographs (10 f-p in frames of ears of wheat with mice) by Mary D.I. Carmichael, lithography by Vincent Brooks. Quarto red gilt cloth lower cover similarly blind stamped (corners worn/spine renewed but binding bright) All Edges Gilt 25pp this includes list of subscribers. *Some foxing and edges browned. There is a narrow fore-edge damp mark but it does not touch the printed area. Some edge-tears but without loss of paper - the endpapers are newer. *FABLE of the Lion and the Mouse. London: Jonathan Cape, 1980. Hardcover. Very Good. 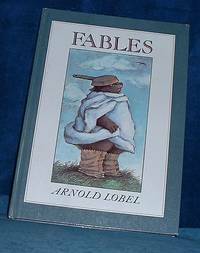 Colour illustated (21 full page including frontispiece) by Arnold Lobel. Folio pictorial boards (slight wear to corners, bit marked). Frontis + titlepage + contents leaf + 40pp + p plate. London: Simpkin, Tegg, Dolman & Whittingham, 1849. Hardcover. Very Good-. Engraved vignettes (109) most fables having a head- and a tailpiece. 120x75mm brown blindstamped cloth with gilt floral decorated spine (tips worn/rubbed) All Edges Gilt xii + 212pp. With Life of Gay by Dr. Johnson. Type reset from 1820 Whittingham Edition *A lovely clean copy without any foxing and with charming detailed illustrations. London: Fredreick Warne and Co, 1887 by inscription. Hardcover. Good. Woodengraved illustrations (80) in text - these are not the Croxall illustrations, they are unsigned but in the style of Harrison Weir but NOT by him Weir although not by him. Post octavo red pictorial cl oth (tips worn/vent to foot) viii + 152pp. Using the Croxall translation of Aesop the Rev. George Fyler Townsend added morals and applications thus The Fox & The Crow moral is Flattery Finds Favour and the Application Compliments cost nothing but many pay dear for them. Amsterdam: Franciscus Halma, 1701. Hardcover. Good. Engraved title page by Goerel/Boutats + 108 round copperplates on 18 full-page leaves signed I.V. Vianen (Jan van Vianen) dated 1701 + 49 woodcut initials & ornate figurative metal-cut head- & tail-pieces (some repeats but large & finely detailed). Quarto gilt-ruled calf (rebacked in leather with original red gilt title label laid on, tips worn) All edges marbled. 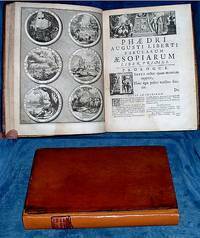 Engraved Title + Titlepage in red & black with metal cut vignette "In hoc signo" + pp prelims +160pp (inc. at end "Appendix Fabularum a Marquardo Gudio) +pp indices, 99 Fables with 9 extra scenes illustrated in great detail in 108 roundelles. Lacks folding portrait of Prince of Nassau (often omitted), Plate 18 misbound at page 50. Some staining from former damp most evident to early leaves & at end of book but hardly affecting the plates. *Most luxurious of the Dutch Phaedrus editions specially made for the Prince of Nassau (Lamb Annales Phaedriani 96, Cohen-deRicci 797-9, Landwehr 247). London: Smith, Elder and Co. + Chalmers & Collins 3rd edition, 1826. Hardcover. Good. Frontispiece (9 scenes on fanned cards) by J.S. Sharpe /Geo. Presbury del. Duodecimo red roan spined pictorial boards (tips worn/upper hinge beginning to crack/cover rubbed & somewhat faded) vi +237 +pp publisher's catalogue. In two Parts separated by a half title and a Preface. The pagination runs throughout but the fables are numbered from 1 to 48 in Part I and from 1 to 78 in Part II. Gift inscription dated 1826 (Charlotte Cecilia Jenkins the gift of her Father) and another 1872 to pastedown and name & embossed address to fly leaf. A marginal tidemark to the frontis but not affecting any other pages. *Not in Osborne which has an edition of 46pgs, but mentions a 5th ed. of 1837 where Sharpe is named as the author. This edition is scarcer than the 1837 5th edition. London: Printed by J. M'Creery for Rivington, Walker & 24 others, 1816. Hardcover. Good. 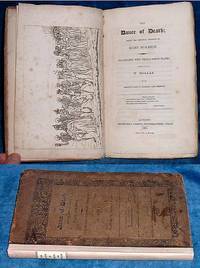 Woodcuts, frontispiece mask & 67 oval illustrations by John Bewick. 18mo (in 6's) 136x85mm marbled calf rebacked with gilt ruled lines and black title label (corners & edges worn). Mask frontispiece + titlepage +222pp +index leaf. Lacks front free endpaper, nice bookplate of Harold & Margaret Mickelmore on pastedown. A few marks and some offsetting of images onto facing text but not affecting legibility. *Strong good woodcut impressions by John Bewick (Hugo 5412). Amsterdam: Zacharie Chatelain, 1727-1728. Hardcover. Poor. Copperplates (129 half-page engravings of 237) by Henri Cause, fine plates well printed and clear. Duodecimo roan spined marbled boards (tips worn). 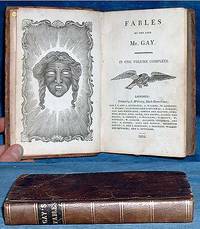 The 7 Books of Fables in Five Parts here incomplete and bound in one volume. Has 3 of 5 Titlepages but the 3rd has been moved to the beginning and has had "Premiere partie" inked over, 3 indices of 4 are present. The Life of Aesop incomplete as are some of the fables, but most of those included have text complete although several are bound out of order. The book is cropped at fore-edge usually the first letters of lines are touched but not illegible but many page numbers are affected. Most plates have frame-lines still visible. Four pages with tear outs affecting text but not engravings, some old paper repairs. *Poor copy offered for the fine PLATES by Henri Cause which are well printed, detailed and charming (Rochambeau 67). Antwerp: Typis Viduae Ioan. 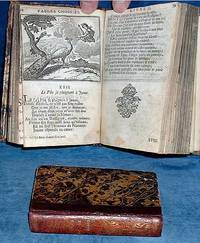 Cnobbari 1st edition, 1639. Hardcover. Very Good-. Emblem copperplates (50) by Andries (signed in emblem p84 as Pauli ie) Pauwels + an Engraved titlepage by Theodore van Merlen all engraved by Abraham van Diepenbeeck who was a pupil of Rubens. Quarto newer full levant morocco blindtooled on 4 raised bands spine compartments gilt and gilt titled spine. 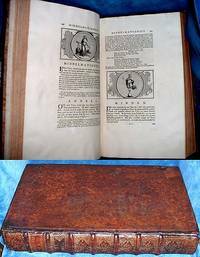 Engraved titlepage +[xxvi] +249pp +pp with Errata list at end of index. The preliminary leaves are misbound within gathering ** & *** but all the preliminaries are present. The title is a bit cropped just into the printed frame-line and the top margin is a bit short in the rest of the book but not touching any headlines or page numbers etc. The other margins are all well clear of printed side notes, text & illustrations. A few early neat ink underlinings & Latin comments. Two leaves are remargined affecting only blank areas (1cm of margin affected) and 4 blank corners restored not affecting any print. A few tears all without loss & professionally repaired. In all this is a nice clean copy with the text in handsome typography enhanced by large tailpiece decorations, with the copperplates in strong impressions. *A very collectable EMBLEM BOOK (Praz 292 Landwehr 72 Brunet I,1405). London: J. Coxhead, 1816. Hardcover. Good. Etchings (33 including portraits) by Hans Holbein engraved by W. Hollar. Octavo(225x139mm) original printed publisher's boards (new spine with printed label/tips worn a bit rubbed but entirely legible) half-title +frontispiece of the dance macaber +31pp (1p=verso blank) + 2 portraits (Hollar & Holbein) +30 numbered plates half title to descriptions of cuts 35-70pp. All plates bound together and all text in French and English. Some foxing but an uncut copy (Grasse III 320 Brunet III 258 text & description differ from 1804 Edition). Rare in the original boards. Amsterdam: Jan Jacobsz Schipper, 1656, 1655. Hardcover. Very Good-. Engraved titlepage + 3 full-page plates + 16, 30, 23 half-page copperplates by or after Adriaen van de Venne (1589-1662) showing customs, family life, agriculture, trades and dances of death. Quarto vellum laced through with yapp fore-edges and faded manuscript title to spine (slightly marked). Half-title and engraved Titlepage dated 1656 to OUDERDOM en BUYTEN-LEVEN +[xxiv]+261pp +pp; HOF-GEDACHTEN (with Titlepage dated 1655) and INVALLENDE GEDACHTEN (with half-title) 125+pp; KONINGKLYKE HERDERIN ASPASIA (with Titlepage and extra frontis plate) +84pp; HUWELIJCX FUYCK (with half-title) 32pp; and DOODT-KISTE voor de LEVENDIGE (with half-title) 224pp. A few tears to margins not affecting printed area, some with marginal paper loss, and light marginal damp-staining towards the end. 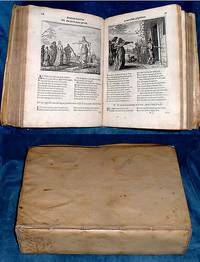 *Narrative poetry by the foremost writer of the 17th century Dutch Republic with many fine engravings of city and country life (by or after van de Venne) and a short series of Dances of Death. First editions here of most of the works written near the end of Cats's life at his country estate near The Hague, Sorgh-vliet or "escape from care", which is illustrated in the centre of the fine frontis to the whole collection. New York: Hurst & Co. Art Edition, 1880 approx. Hardcover. Good. 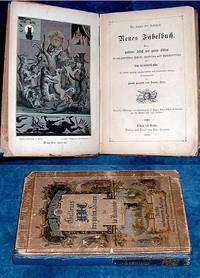 Engraved plates (65 & frontis Portrait) + 188 headpiece illustrations to each Fable by Gustave Doré and approximately 100 tailpieces with some duplicates. Quarto 28x22cm. green gilt pictorial cloth (tips worn/bumped and rubbed) 557pp The book block is loose in the covers. 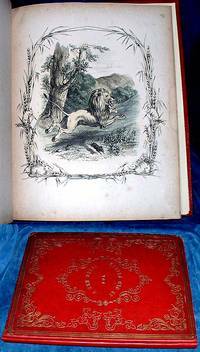 *Compared to the Cassell edition of 1876 The HURST EDITION has 56 fewer fables and 2 less plates. There are also 2 plates which differ substantially (XXXIV & CXXXI) from the Cassell Editions. Also the titlepage calls for Life of La Fontaine and Aesop, neither of which are present and never were, but there must have been a "larger" Hurst edition with these present as the collation begins with  (in 4's) WITHOUT COUNTING IN ANY OF THE PLATES. The pagination however does count in the plates. 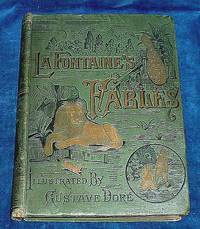 The text and numerous fine Doré illustrations are however in very good condition and well presented in this New York edition. 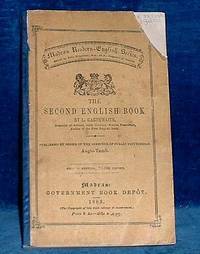 Madras India: Government Book Depot 2nd edition, 1883. Hardcover. Fair. 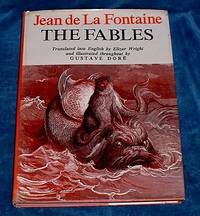 Duodecimo blue cloth spined printed boards (corner missing) 242pp *MANY FABLES with Tamil translations, questions & exercises on them MOST with one or more "imitative stories" ie Fables in which the protagonist animals are changed. London printed in Spain: Jupiter Books 1st thus, 1975. Hardcover. Very Good/Good. Frontispiece portrait of La Fontaine with illustrations (about 30 full-page + text illustrations on yellow half column) after Gustave Doré. 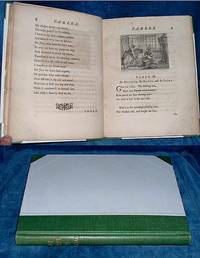 Small quarto cloth in dust jacket (tips rubbed) 224pp. Text in French and English. Corner of front endpaper cut away else V.G. *Taken from the 1867 edition. London: Blackie 1st thus illustrated, 1964. Hardcover. Very Good/Very Good. 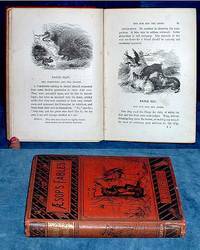 illustrations ( circa 24 f-p + text) by Cyril Deakins 16mo blue boards in price clipped dust jacketwith color illustration of the fable of the tortoise and the hare (jacket rubbed to edges else V.G) 128pp No inscriptions, no loose pages a very good copy. London: Printed for J. Tonson and J. Watts 1st edition, 1727. Hardcover. Good. Titlepage in facsimile, 51 copperplate vignettes (complete) illustrating the 50 Febles after designs by John Wootton and William Kent, engraved by P. Fourdrinier, G. Van der Gucht and others. Quarto new half green cloth, spine title gilt, new & older endpapers. Titlepage (facsimile) +[xii]pp (Dedication, Table & Introduction) +173pp with the copperplates complete. Paper tanned throughout with some browner margins and sporadic light foxing. 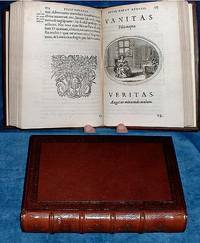 *This first edition was the only one to be published in quarto size (all later printimgs octavo or 12mo). The second volume was not published until 1738, after Mr. Gay's death (Lewine p206, Rothschild 925, Foxon p295). The modern binding of this copy is not sympathetic, but the book is priced to leave room for rebinding, to match a second volume if required. London: Bohn Chiswick Press/Whittingham, 1845. Hardcover. Very Good-. Wood engravings (280) prepared by the best artists & engravers. Octavo new blue half calf raised gilt bands red label lx +248pp. *Cuts earned the high praise of even Thomas Bewick. In writing the fables Northcote had help from William Hazlitt. 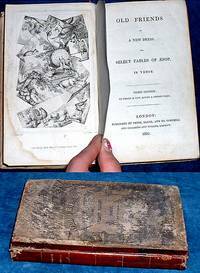 First published in 1833 under the title "Fables Original & Selected". Here there is a new titlepage vignette by Topham/Rolls. Some foxing but a pretty copy in nice binding. NEUES FABELBUCH Ein goldnes ABC der guten Sitten in ausgewaehlten Fabeln, Spruechen & Sprichwoertern fuer die Kinderstube .. Mit 82 Text-Abbildungen . Leipzig & Berlin: Otto Spamer 3rd edition, 1884. Hardcover. Fair. Frontis in black blue & red shades + 82 text illustrations after F. Flinzer, A Richter, O. Rostosky et al. Octavo blue cloth spined boards (small part of old spine relaid, tips worn & one corner repaired with loss to margin of paper on cover) xii +186pp + catalogue. First few leaves chipped and lower corners rounded, book block seems to have been recased with inner hinges strengthened. Lacks front fly leaf and half title has neat ownership inscription else clean and tight. *Fables in German text throughout from a wide variety of authors and illustrators. Alnwick: W. Davison, 1814. Hardcover. Fair. 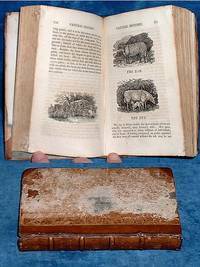 Woodcuts (63 including a few charming tailpieces) by Thomas Bewick. Duodecimo 1571x940mm half tan roan gilt ruled on 4 raised bands (upper cover held by cords/edges worn/rubbed) vi(recte viii)-336pp. Early book plate of Rev. J. Surtees. Fore-edge grazed but not encroaching on margins, last 6 leaves with worm track in lower margin not touching print (HUGO 283).